Garmin zumo 390LM motorbike sat nav features a bright 4.3-inch glove-friendly touchscreen colour display. Garmin zumo 390LM all feature Bluetooth, Lane Assist with Junction View. The zumo 390LM preloaded with full European mapping, and what's more as the zumo 390 is a 'LM' (Lifetime Maps) model it includes FREE access to new street-level road maps for the life of the product. When a new map is available you can download it to the zumo 390 via your PC. In addition the zumo 390LM can also be mounted in a car with the provided car mount and cigarette lighter adaptor. The zumo 390 is the most advanced model as it connects to your phone via bluetooth, has a curvy road feature and is ANT+ compatible for interoperability between devices such as tyre pressure valves. Garmin zumo 390LM has been discontinued. The Garmin zumo 390LM has been replaced by the zumo 395LM. (pictured below). Accessories are available for your Garmin zumo 390. Likewise you can buy new maps. The Garmin zumo 390LM system includes a 4.3-inch displays, is waterproof and rugged, has lane assist and PhotoReal Junction View, Bluetooth for navigation and road speed limits and speed camera database. The mapping on the 390LM is full European and these maps can be updated as often as a new map is released for the lifetime of the device. ‣Lane assist with junction view, realistically displays road signs and guides you to the correct lane, making unfamiliar junctions and exits easy to navigate. Rugged and waterproof to IPX,Garmin zumo 390LM is built tough for bikers - by bikers. The GPS systems have been tested on rutted-out roads, cobblestone streets, in heavy rain and glaring sunshine and the result was always the same - zumo kept on navigating. The Garmin zumo 390LM, like all Garmin sat nav's, gets its speed camera data from the Cyclops speed camera database. The database provides advanced alerts to fixed, average speed, mobile, variable, temporary roadwork, red light and red light speed cameras. As you approach a camera, your device sounds an alert. Subscription charges apply. Click here to read more about the Cyclops speed trap database. Cardo Scala Rider headsets are available to pair with your Garmin zumo 390. The benefits of buying and using a Scala Rider headset with your Garmin zumo 390 are three-fold; 1. you can listen to sat nav voice turn-by-turn instructions, 2. listen to music and 3. communicate with other motorcyclists whilst riding (using the intercom when within range and mobile phone when out of range). Garmin zumo 390LM series is secured to your motorcycles handlebar using the supplied handlebar mount and Garmin motorcycle mounting bracket. In addition the Garmin zumo 390LM also comes complete with automotive suction mount and vehicle power cable, enabling you to install and use the Garmin zumo sat nav in your car as well as your motorcycle. The Garmin zumo 390LM both feature full maps of Europe which include City Navigator NT for UK, Ireland, Western and Eastern Europe. These maps can be updated FREE for the life of the product, when you register your zumo 390LM with Garmin UK. Further Garmin zumo 390LM series maps are available on SD card which insert directly into the Garmin zumo GPS system. 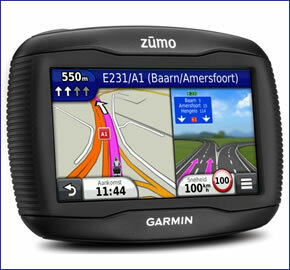 Available Garmin zumo 390LM series maps include North America, Australia and New Zealand, Middle East and Southeast Asia. Click here to view Garmin zumo 390LM series maps. The zumo 390LM includes all the accessories you need to get you up and running, not only on your motorbike, but also in your car/van too. However, if you'd like to take advantage of the zumo 390 ANT+ connectivity, you might like to consider buying some tyre pressure monitor caps. Many additional parts are also available including a hard carrying case, handlebar mount kit and motorcycle power cable. The Garmin zumo 390LM is preloaded with street-level road maps for all of Europe. If however, you want to take the zumo 390LM further afield, we may have the map that you need. Garmin zumo maps available include: USA, Canada and Mexico, Australia and New Zealand, Morocco and Southern Africa. Question: I have a Garmin zumo 390LM. Do you sell a complete 2nd bike mounting kit with all the mounting hardware and power supply so I can easily switch the GPS to my second bike? Answer: Yes we do sell a Garmin zumo 390LM complete second bike mounting kit. You can also view all Garmin zumo 390LM accessories. Question: I wish to use the zumo 390lm on two bikes. I would fit power lead to both, but will the cradle plug into either lead or is cradle permanently fixed in which case I would need two cradles also? While the Motorcycle Power Cable isn't supplied with a permanent connection to the Motorcycle Mounting Bracket, there is very tiny small screw (to secure the cable to the back of the mount) which would be very fiddly to undo and redo each time you change the mount over - plus it would take quite a time to remove the associated handlebar mount from bike to bike. So we would recommend that you buy the above accessories twice over. You can view and buy all available and compatible accessories for the zumo 390LM here. Do you have a question about the Garmin zumo 390? Submit your question via our contact page.